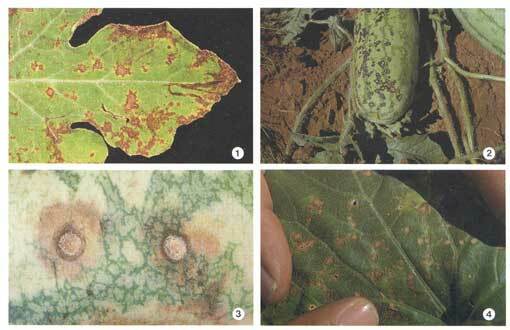 Anthracnose, caused by the fungus Colletotrichum lagenarium, is a destructive disease of cucurbits occurring during warm and moist seasons. Significant damage can occur to cucumber, muskmelon, and watermelon unless resistant varieties are grown. Squash and pumpkins are rarely, if ever, infected by the pathogen. This disease is most common in the southern, mid-Atlantic, and mid-western states, but can occur in New York if temperatures are at or above normal and frequent rains occur during the summer to promote disease development and spread. All aboveground plant parts can be infected. Symptoms vary among the three principal cucurbits infected. Leaf lesions begin as water soaked and then become yellowish circular spots. On watermelon foliage the spots are irregular and turn dark brown or black (figure 1). On cucumber and muskmelon (illustrated) the spots turn brown (figure 4) and can enlarge considerably (figure 5). Stem lesions on muskmelon can girdle the stem and cause vines to wilt. Stem cankers are less obvious on cucumbers. The most striking diagnostic symptoms are produced on the fruit, where circular, black, sunken cankers appear. On watermelon the spots may measure 1/4 to 1/2 in. (6 to 13 mm) in diameter and up to 1/4 in. (6 mm) deep (figure 2). When moisture is present, the black center of the lesion is covered with a gelatinous mass of salmon colored spores (figure 3). Cankers lined with this characteristic color can never be mistaken for any other disease. Similar lesions are produced on muskmelon (figure 6) and cucumber. The anthracnose fungus overwinters on diseased residue from the previous vine crop. The pathogen may also be carried on cucurbit seed. In the spring under wet conditions the fungus releases airborne spores (conidia) that infect vines and foliage. The fungus depends on wetness and fairly high temperatures, 75°F (24°C) being considered optimum. Conidia do not germinate below 40°F (4.4°C) or above 86°F (30°C) or if they are not supplied with a film of moisture. In addition, the pathogen must have water to free the conidia from their sticky covering in the fruiting body. The fruiting body is slightly saucer-shaped and lined with microscopic stalks. The microscopic stalks produce the conidia, which amass in sticky, flesh-colored tendrils. As long as the tendrils remain dry, the conidia cannot escape, but a heavy dew may dissolve the mucilaginous covering and then rain drops splash them several feet. Anthracnose usually becomes established in mid-season after the plant canopy has developed. 1. Use commercially produced, disease-free seed. 2. Rotate vine crops with unrelated crops in a three-year rotation. 3. Practice good sanitation by plowing under fruits and vines at the end of the season. 4. Choose anthracnose-resistant varieties if at all possible. Resistant cucumber slicers include Dasher II, Slicemaster, and Poinsett 76. Many pickling cucumbers are tolerant or resistant, including Score and Premier. Resistant watermelon varieties include Charleston Gray, All Sweet, Crimson Sweet, and Dixielee. No anthracnose-resistant muskmelon varieties are currently available for the Northeast. Apply approved fungicides to the crop at regular intervals, more often if frequent rains occur. Among fungicides available are chlorothalonil (Bravo), benomyl (Benlate), and maneb and mancozeb formulations. An effective spray treatment has been the combination of Bravo with Benlate or mancozeb. If angular leaf spot should be a problem, substitute a copper compound for Benlate in the combination. Refer to the most recent issue of Cornell Vegetable Recommends for registered products for each cucurbit and follow label directions.